This tiny Jamaica Plain neighborhood gem hosts just ten tables with panache. 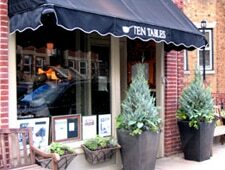 : Jamaica Plain's Ten Tables turns its downside --- the name says it all --- into a virtue. Sure, it's small, but being cozy oftentimes means better service and a heightened focus on the food. There's nary a curtain, much less a wall, to divide the kitchen from the wee dining room; amidst the resulting bonhomie, customers get dinner and a show. Owner Krista Kranyak and crew graft a bit of Gallic sophistication onto ingredients both homemade and locally sourced, then nudge them into eclectic forms. The menu changes frequently and is complemented by chalkboard specials, nightly bargains like Beerger Mondays pairing burgers with beer, and a four-course tasting menu (also available vegetarian) served every night but Tuesday and Wednesday. You can always rely on the charcuterie barboards, seafood specialties and creative appetizers. From revised classics such as orange and dill pork and oat-crusted mackerel to original creations like roasted zucchini with sunchokes and couscous, the flavors are always fresh and bright. Finish with a trio of ice cream and cookies. Also located at 5 Craigie Cir., Cambridge, 617-576-5444.